Since arriving on September 28, I've been out of the city a few times. One of those was the trip to Delft with Amanda. I also took the train up to Groningen. Groningen is the name of a city and a province. The ride to the city was a couple of hours from Centraal and was enlivened when I got on the wrong train at one of the stops I was supposed to change trains. Fortunately, I ended up where I was supposed to; it just took longer. Explanation: There are two types of train lines: Sprinter and Intercity. Sprinters have more stops and are more like the "local". Intercity trains have fewer stops so theoretically get to the further destinations quicker. When I was supposed to change, I jumped off my intercity onto a sprinter. It was headed in the right direction and I managed to connect back an intercity train in Zwolle. The train system in the Netherlands is great. The trains seem to mostly run on-time or only a few minutes later and there are a lot of them. Going to Groningen, I could leave nearly any time I wanted. Once in Groningen, I rented a car and headed north. I was after two things. I wanted to see what the country looked like outside of a big metropolitan area and I wanted to see the villages around the area from which my family emigrated in 1853 (or 1852 depending on which document you read). My first stop was Hornhuizen and the local graveyard. Hornhuizen today is little more than a few houses and a couple of small businesses and a church. I wondered whether it was always like this or whether it was more back when this was thriving farming area. After stopping for directions a couple of times (one of which I got to practice my Dutch because I found someone who didn't know English), I found the graveyard, which turned out to be right behind the church. 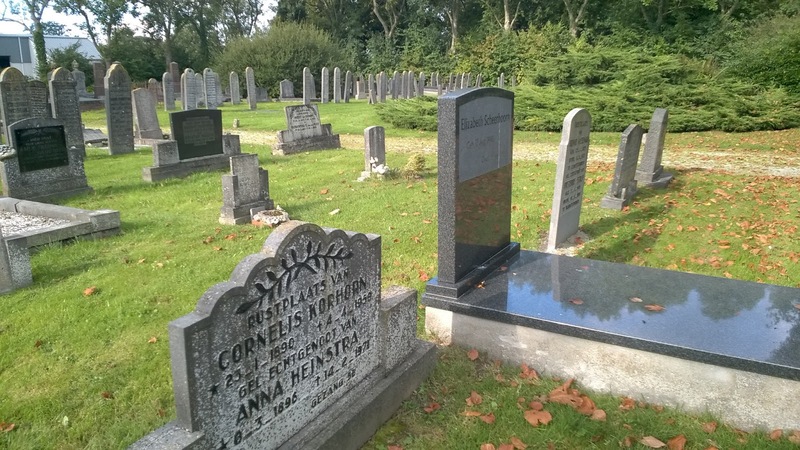 I was looking for the grave of my great-great-great-grandfather, Renne Luies Dijkhuis, who passed away in 1850. It was a small graveyard and had one Dijkhuis gravestone but not Renne Luies. Two workers from the local muncipality came by to do some cleanup and I asked one of them whether there were records about who was buried here. He said yes but not here. I told him who I was looking for and the date. Apparently, graves were (are?) reused here, just as they were in the Oude Kerk so a grave more than 175 years old is probably long gone. His cleaning partner was an older man and had lived in the area a long time. He pointed to the church and said that some of the wealthier people were buried in the church yard. 175 years ago farmers were considered wealthy people because of their land holdings. The three of us walked around the church but found no evidence of more Dijkhuis ancestors. he emigrated from when he was 9 or 10 years old. Ulrum is more of a town than Hornhuizen but still quite small with about 1,200 residents. I did find one distant cousin at the graveyard there. 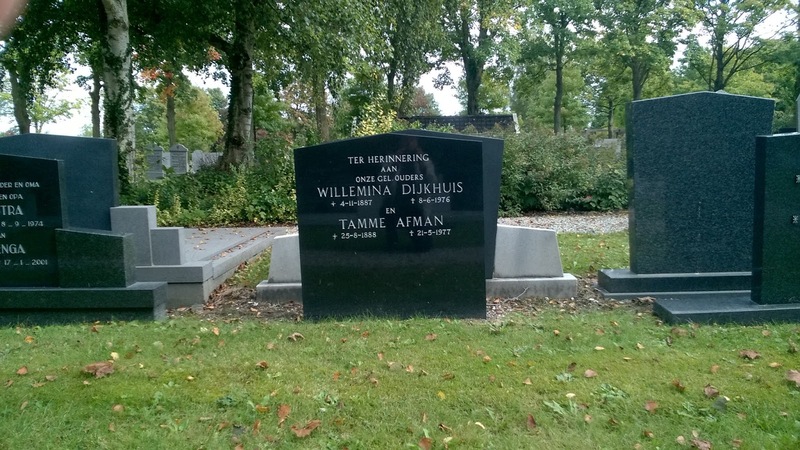 Willemina Dijkhuis was the grandchild of Klaas's uncle, which would make her a distant cousin of mine. She died in 1976 and had several children. I've had no luck yet locating any of her living children or grandchildren. It was a very quiet afternoon in Ulrum. I only saw a few people on te street and they seemed to be kids getting home from school. There was also what seemed to be a paper boy making deliveries. Quite a throw back in time, that. I have long heard about the Dutch custom of keeping the curtains wide open in the front room. That way passers-by would see the neatness and perhaps the number of possessions in the home. It's one thing to hear about that and another to really see it. The houses are very close to the street, most not more than 6 feet or so from the edge of the sidewalk or street. It felt a little like invading their privacy by being able to see so clearly into the homes. But it was the same in nearly every home in every small town that I traveled through. By this time it was late afternoon and time to think about finding a hotel for the evening. 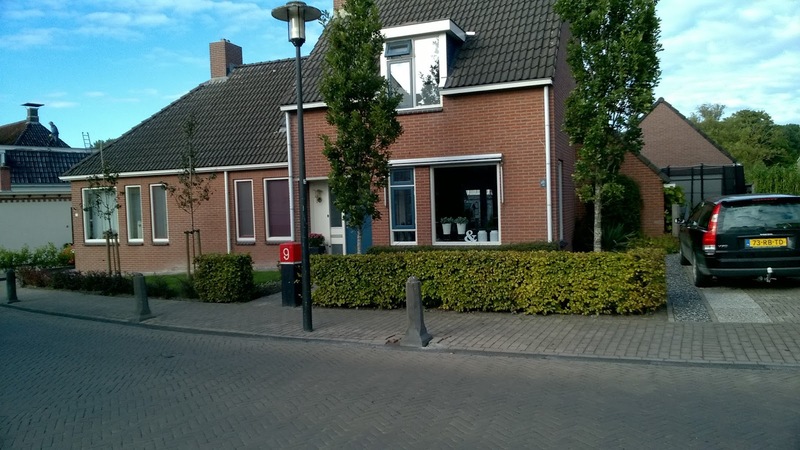 I was in a sparsely populated, by Dutch standards, area of the country and there were no roadside signs directing me to the nearest chain hotel. In fact, I couldn't find any indication of a hotel or inn anywhere. I decided to head for the nearest big town and on my map that looked like Winsum. I parked my car and found my way to an open cafe. When you can't find a hotel, a cafe with beer is the next best thing. It was about 4:00 and the pub was nearly empty. I sat at the bar with three locals, probably folks who gather there most afternoons for a beer and some gossip. We struck up a conversation and they asked where I was from and what I was up to. One of them, an older gentleman, with rough hands and a deep voice said that all the small towns in the area were getting smaller. The young folks were growing up and leaving, going to the big cities. He seemed a little angry about it, yet resigned. I told him that the same thing is happening in America, and he nodded. He did tell me about a local hotel. After several wrong turns and unhelpful guidance from the GPS lady, I did find the place. It turned out to be a repurposed campground that was closed for the season. After another map consult, I headed for Uithuizen, and after stopping to ask at a Chinese restaurant, which was the only place with lights, I was directed to Hotel het Gemeenthuis, a lovely small hotel just a block behind the Chinese restaurant. Yes, they had rooms. In fact, it looked like I was the only guest that evening. They were still serving dinner so I had a tasty dish with vegetables, tofu, potatoes, and bread. What more could you ask for on a chilly autumn evening? The next day I headed to Leens. With the help of graftombe.nl, I hit the jackpot there. As I was walking into the cemetary, I happened to look left and immediately found my first Dijkhuis. It was Jozeph, one of Willemina's brothers. In fairly short order I found several others. There was Pieter, Jozeph, and Brechtje, all siblings. The oldest grave was their father, Luie Renne Dijkhuis. Luie was a first cousin of my great-great-grandfather Klaas. His father Willem was Klaas's father's brother. It was kind of cool. I didn't exactly feel special emotions but after spending so much time looking at my family tree, there was a sense of kinship. Every time I found another Dijkhuis, I would say aloud, "Oh, there's Jozeph." And "Hot damn, there's Luie Renne." After Leens, I took a drive up to the coast. It was a cold, blustery day and got more so the closer I got to the ocean. I didn't have a lot of time, but I found a place to park and climbed up a dike. I walked along it a little bit, just long enough to get chilled then headed back to Groningen. The city of Groningen is home to Rijksuniversiteit Groningen, and it is very much a college town. I was there long enough to stroll around town and get lunch: a cone of freshly fried frites and an apple turnover. I should say a bit about driving through the Dutch countryside. It's fairly easy. The roads are all flat, very narrow, and sparsely traveled. With the price of gas around $8.00 per gallon, it's not hard to see why there are few cars on the road. Driving in the towns, even the small ones, is a bit more challenging because there are no straight streets anywhere in the Netherlands. They all curve and circle around so there is no such thing as going around the block to get back to where you took a wrong turn. And, of course, this being a trip with me as navigator there were plenty of wrong turns. The narrow roads that go through the countryside get even narrower in the towns. 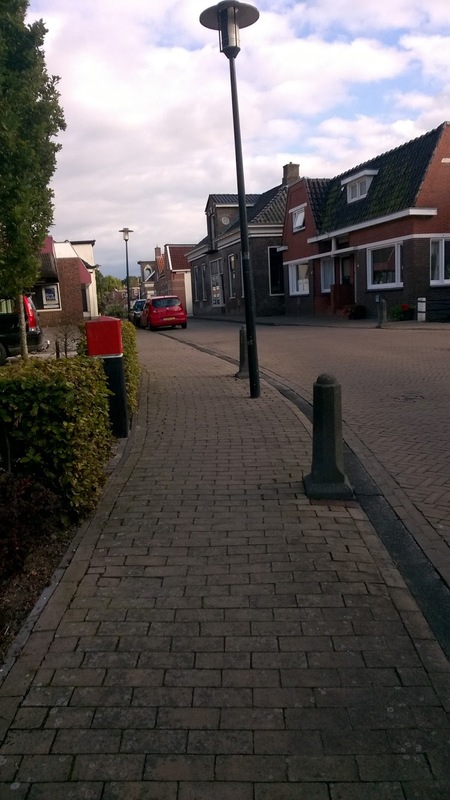 In Winsum, I ended up going down this little lane that got narrower and narrower until the street just ended. I managed to back up and get myself turned around but not before I thought I was going to leave some paint on the side of another car or building. On my next trip, I would like to spend more time in the provinces. I'd like to come when the weather is a bit warmer and hike or bike along the coast. It looks like a lovely area to be out-of-doors. Rowling, J. K. Harry Potter and the Order of the Phoenix. Scholastic Books, 2003, 870 p.